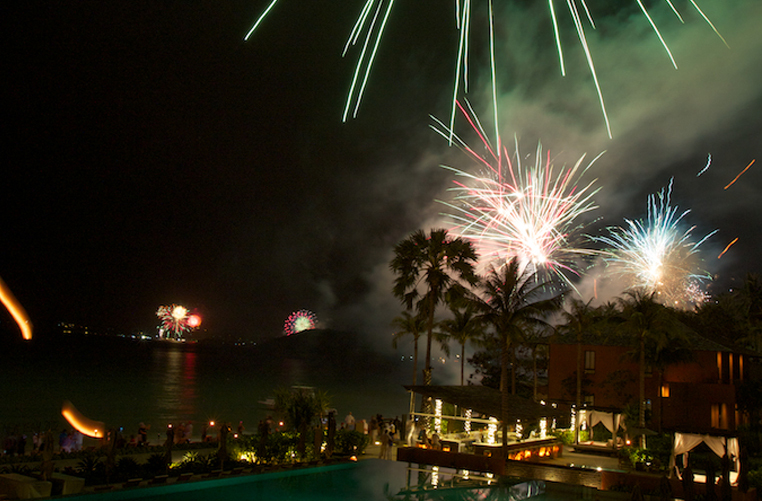 Overseeing the culinary team at Hansar Samui is Executive Chef, Decha Toolthaisong. 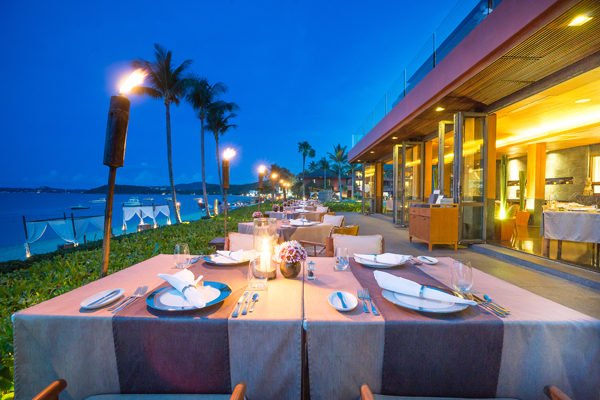 He has created an epicurean experience for resort guests where they can appreciate the authentic taste of French Mediterranean Cuisine, in addition to a Thai menu at the beachfront H Bistro Restaurant. 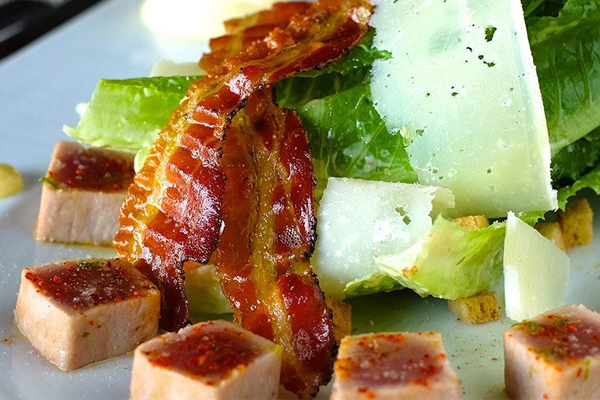 Menu highlights include fresh Maine lobster and oysters flown from Canada, Japan, and France, complemented by a carefully handpicked list of International wines and champagnes. 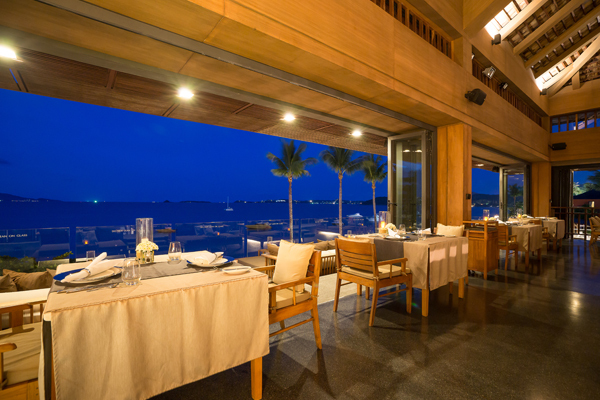 Sunset cocktails and finger food are best enjoyed at the elevated Chill Lounge - overlooking the golden sands and turquoise waters of Bophut Bay, The chic and trendy Chill Lounge showcases a carefully hand picked International wine list and innovative cocktail menu. 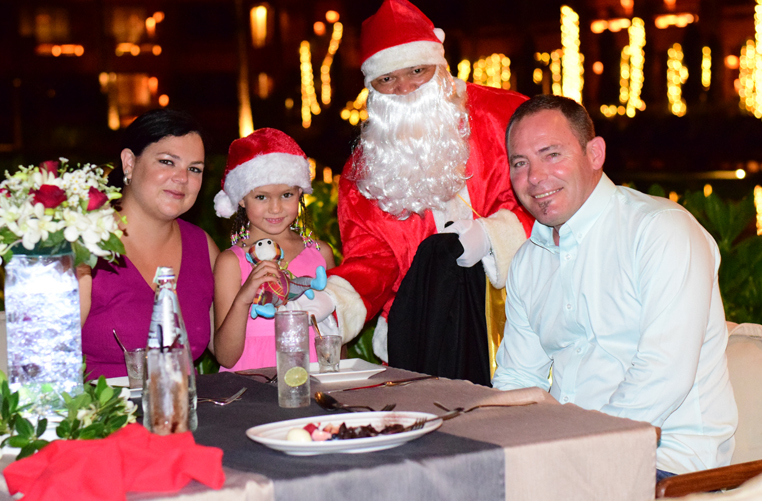 Alternatively guests can enjoy snacks and refreshments poolside or beachside, and relax and the beach bar which is hugely popular during happy hour. 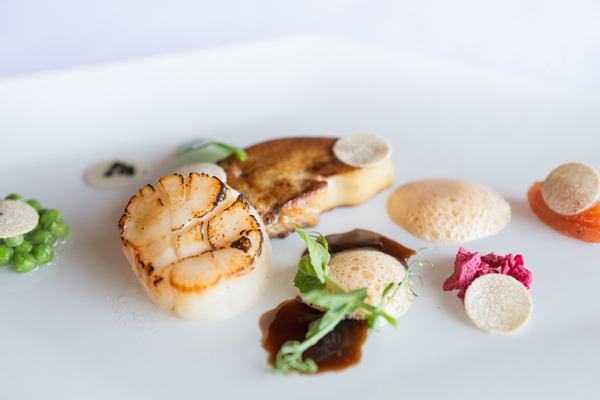 Strongly focused on providing cuisine at the highest level, the resort's signature dining experience, H Bistro features a fresh French Mediterranean menu and exclusive wine list. Enjoy true Mediterranean spices merged together with ingredients ranging from imported fresh Maine lobster and oysters from Canada, Japan, and France. 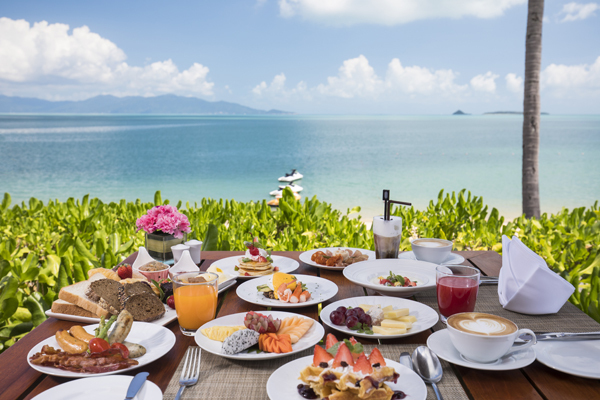 Welcoming guests from all over Koh Samui, H Bistro's indoor and outdoor dining spaces are yours to experience from breakfast until late at night. 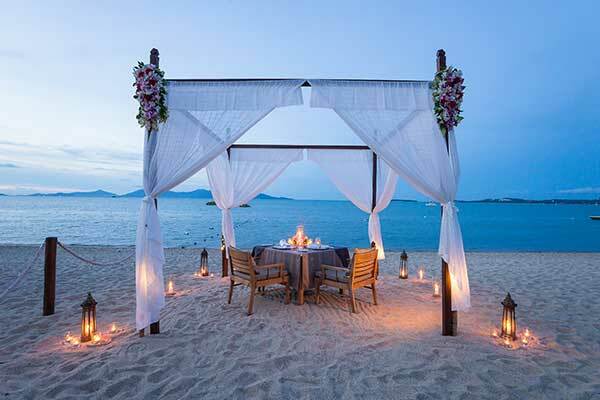 Hot on the heels of winning the TripAdvisor Certificate of Excellence Award and the Thailand Tatler's Best Restaurants award for 2011, 2012 and 2014 for the popular H Bistro, Hansar Samui's newest culinary delight is the romantic flame-lit beach front dinners for two under the stars, complete with barefoot Butler service - it doesn't get any more decadent than that. Now there's a photo to make you the envy of all your facebook friends! 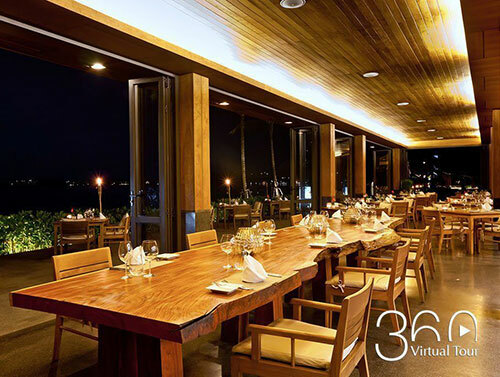 Hansar Samui's innovative Executive Chef, Decha Toolthaisong has created an exceptional series of mouthwatering menus which change on a monthly basis. 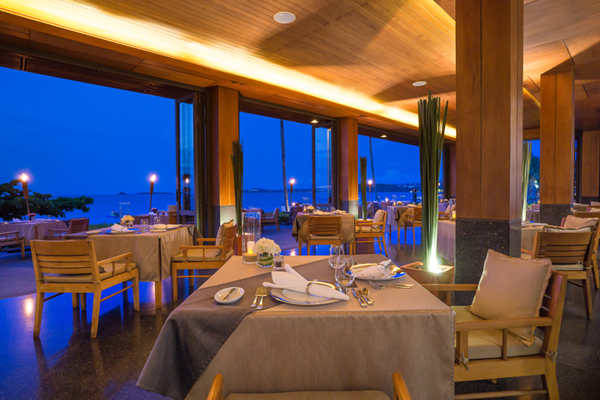 Chef Decha also includes complimentary surprises of amuse bouche and pallete cleansers during the meal. 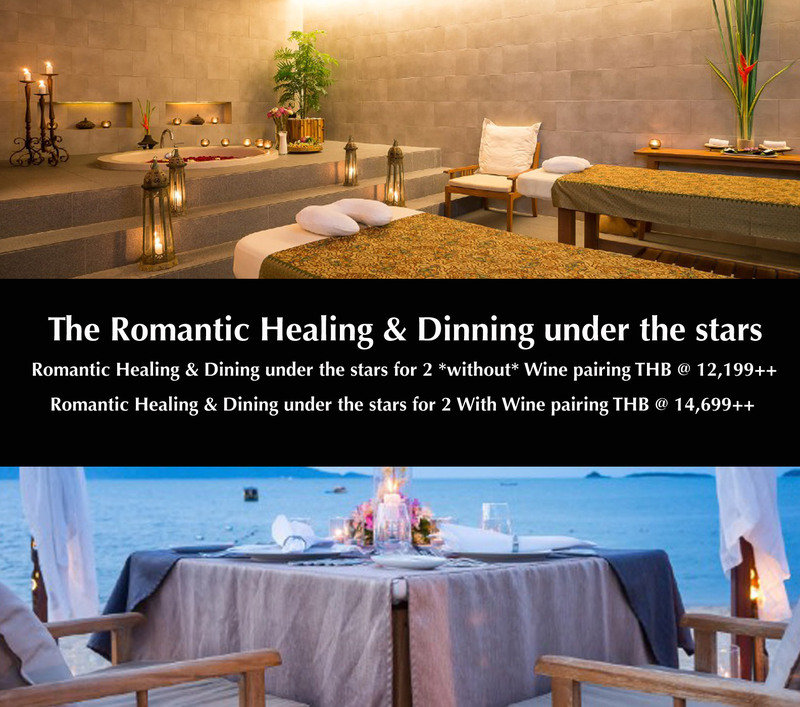 Dining Under the Stars are priced at Baht 5,199 without wine paring and Baht 7,699 with wine paring, plus applicable government taxes and service charge. 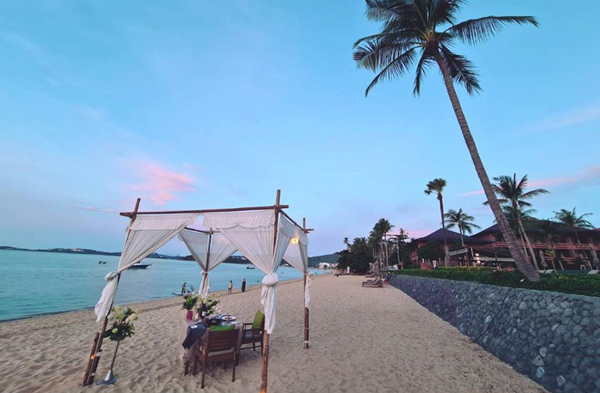 Overlooking the golden sands and turquoise waters of Koh Samui’s up-market Bophut Bay, the elevated Chill Lounge offers a chic and trendy living space at the heart of the hotel. 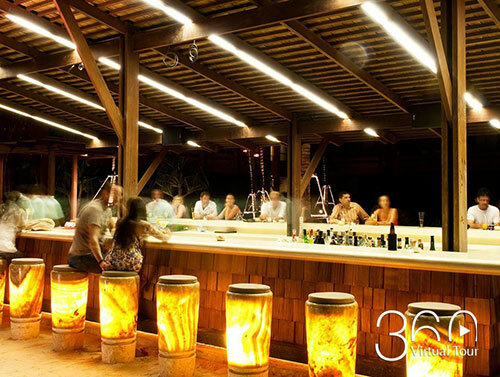 The Chill Lounge showcases a carefully hand picked International wine list and innovative cocktail menu. 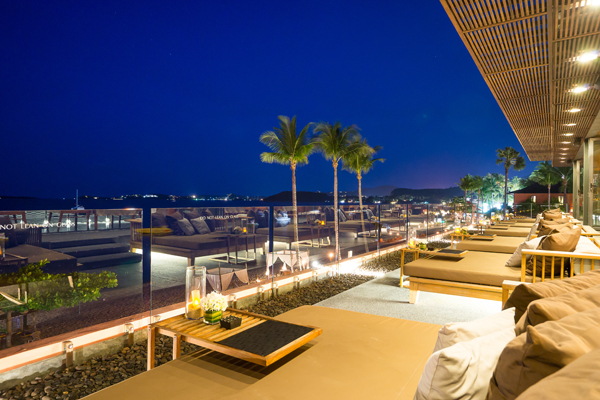 Take time to reflect over stunning sunsets, or just enjoy a drink by the bar or lounge on the daybeds on the balcony. Enjoy beverages, snacks, delicious homemade ice-cream and freshly blended fruit drinks poolside on our cushioned sun beds. 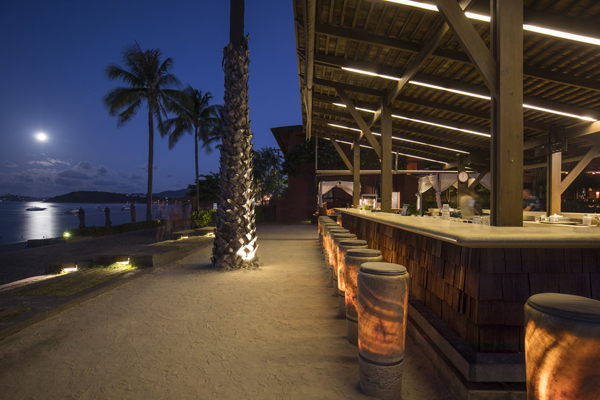 This venue is especially popular for happy hour as day turns to dusk. Also, do not miss our special weekly promotion such as Mondayjito, Ladies 'night and so on. 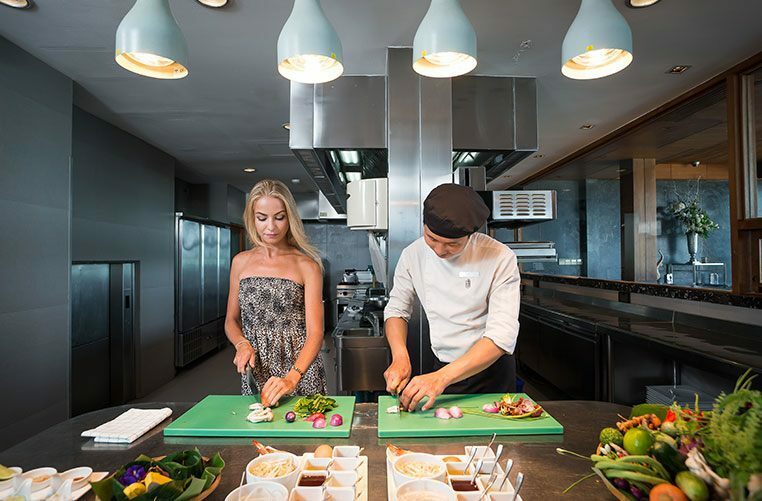 Following the launch of its new organic garden, Hansar Samui's popular cooking classes now include a tour where guests can learn about the different kinds of fruit, vegetables and herbs being grown, and collect these at their absolute freshest, for use in their cooking class. Souvenir recipes enable guests to recreate their dishes once they get home and impress family and friends with their new-found expertise will be made available after the course. Guests also receive a certificate from Executive Chef, Decha Toolthaisongon completion of their class. After a welcome cocktail to get into the mood, the 90-minute class allows guests to get hands on behind the bar, shaking up two different types of cocktails, as well as learning some bar skills and tricks. At the completion of the class, they get to relax and enjoy their creations, with finger food and are given a certificate and a further farewell drink. Classes are priced at Baht 1,640 per person and Baht 2,800 per couple, plus applicable government taxes and service charge. Advance booking and complete deposit process will Get one bottle white or red wine. 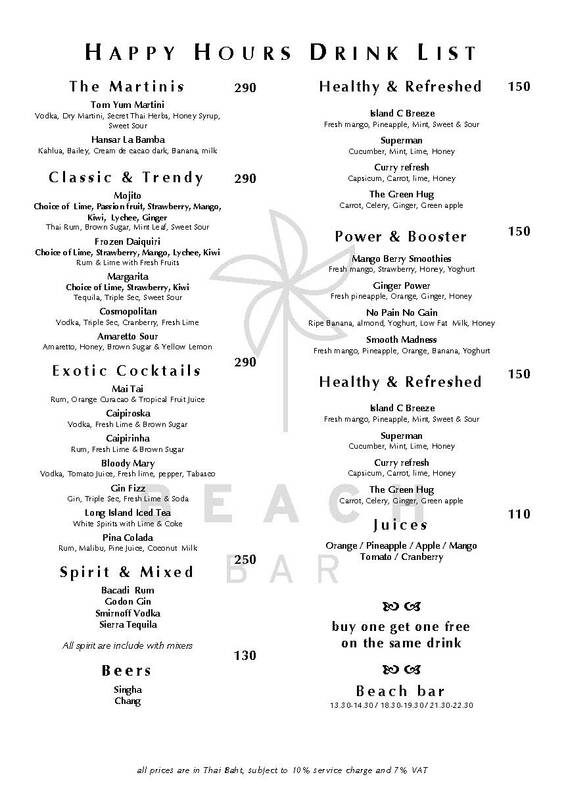 Hansar Samui's New Decadent Sunset Cruises: Champagne, Cocktails, Imported Oysters and Dean & Deluca Sweets. Hansar Samui's romantic new Sunset Cruises add yet another dimension to the Hansar Experience as guests sail off into the sunset with a cocktail in hand (well one at a time) and imported oysters on ice. Guests board Hansar's 30 foot yacht directly from the Hotel's Beach at 4:00pm and cruise for three hours in decadent style with champagne, oysters, cocktails and totally irrestible Dean & Deluca milk chocolate maltballs. On board, guests receive refreshing cold towels and Hansar's own LUXSA Spa brand sun lotions and misting sprays. In addition to a complimentary glass of Champagne on boarding, guest will enjoy a range of freshly concocted free flow Hansar signature cocktails, with soft drinks and mineral water. 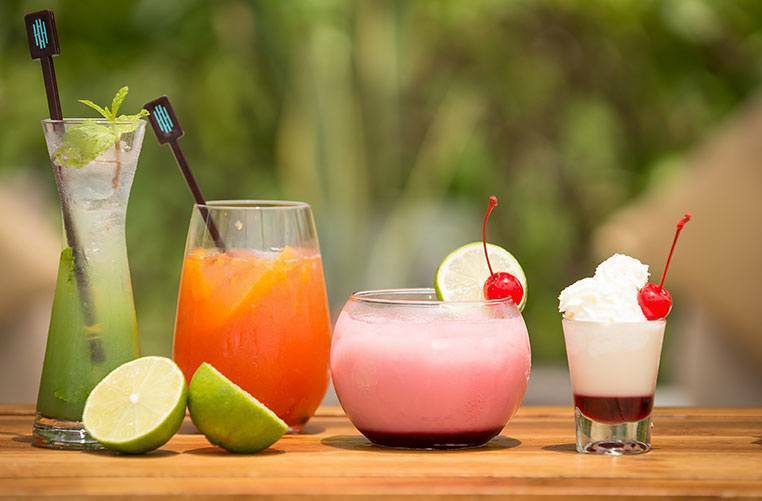 Cocktails include the Hansar Margarita, Hansar Mai Tai, Hansar Mojito and Hansar Caipirinha. A selection of house wine and beer is also available. A range of imported oysters will be served including Fine De Claires (France), Kumamoto (USA), Tatamagouche (Canada) prepared by creative Epicurean Executive Chef, Decha Toolthaisong. 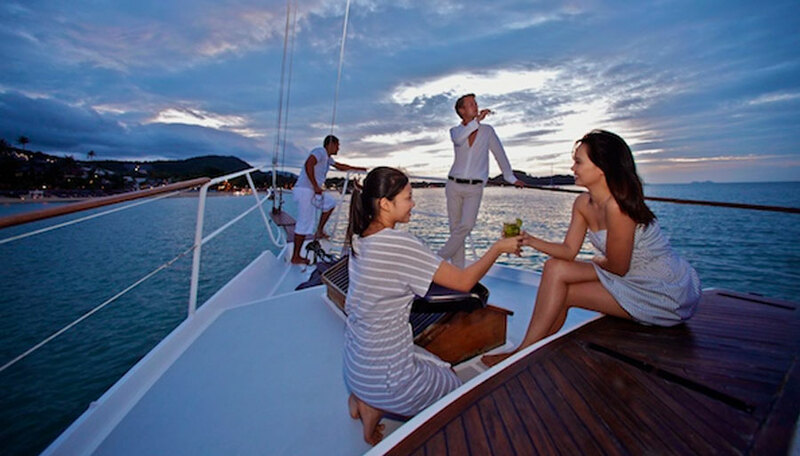 The Decadent Sunset Cruises are priced at Baht 7,800 per person, plus applicable government taxes and service charge.